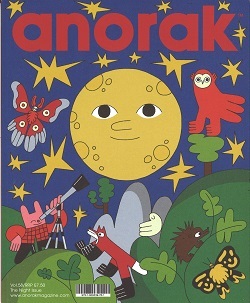 ANORAK is the internationally acclaimed happy mag for kids! Since its launch in 2006, ANORAK has broken new grounds in terms of visual communication for children. It has a unique format consisting of brand new stories written and illustrated by the most exciting contemporary illustrators, a ‘good stuff’ guide, games and some fun activities.